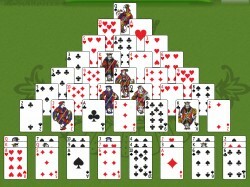 - Inverted pyramid of 28 cards. Only uncovered cards are available for play. Discard pairs of cards whose ranks add to 13. Kings are discarded singly. To discard a pair, drop one card on the other. - stock (face down) - turn over cards one to each waste pile by clicking. No redeals. - 2 waste piles (below stock) - The top card is available for play.